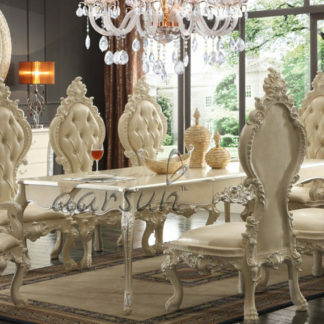 Aarsun Woods brings furnish Wooden Dining Set made from premium quality sheesham wood by experienced artisans. A simple dining area that has a brick fireplace. The wooden dining set compliments with the flooring as well as the fireplace.Dark wood dining set with a square table on a pedestal base. A pedestal style dining room table is modernized with a square table top. The deep wood finish is an elegant touch and a stylish addition to your dining room decor. A high quality furniture with excellent design and elegant style which has superior ample chairs. Rosewood is most famous for high oil content making it smooth and thus giving this quality to our Wooden Dining Set as well. Rosewood wooden dining set has medium texture to coarse with a natural luster. Rosewood temple is famous for creating furniture because it does not twist / bend and split. It is the highly permanent and is somehow free from dry-wood termite. Rosewood wooden dining set has a very indistinct color and gives very well finish after hand waxing. Some of our Rosewood Wooden Dining Set have wrought iron work which only is possible with Sheesham Wood as it goes with wrought iron very well. Rosewood Dining Set is also used in maritime and aircraft grade plywood. Rosewood is perfect for creating unique furniture for home and restaurant as it gives a very still finish to the product. 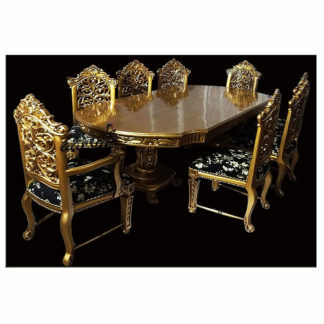 A wide range of Wooden Dining Set are available in Sheesham Wooden Dining Set, Traditional Designer Dining Set .